We manufacture screw and CNC machined components as per customer requirements. We can take your parts from concept to production. Turbo Machine Technology, Inc. has always believed that the principle of mutual benefit - between customers, employees and communities - is the most effective route to profitable and sustainable growth. "Provide the highest quality, precision product in the quickest manner possible. To always exceed our Customers expectations. To offer competitive pricing for the highest level of workmanship." Turbo Machine Technology, Inc. is dedicated to providing our customers with complete customer satisfaction. We believe each and every one of our customers is our most valued customer. Turbo Machine Technology, Inc. will provide defect free products and services that meet or exceed our customer’s expectations. Any company is interested in stable operation. Long-term cooperation with its partners is Turbo Machine Technology, Inc.'s priority. 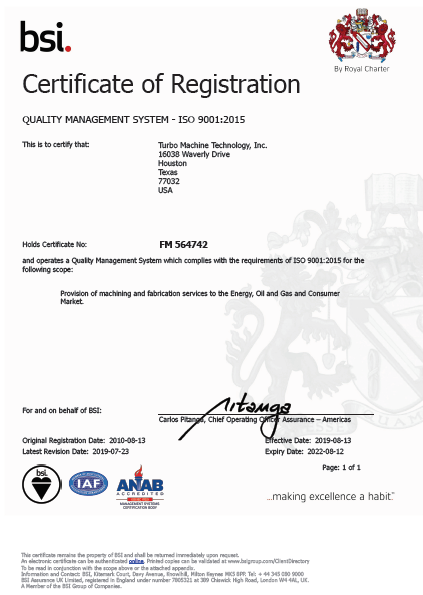 Turbo Machine Technology, Inc. will continually improve the effectiveness of the Quality Management System with emphasis on value added activities by implication of the Quality Management System thereof.